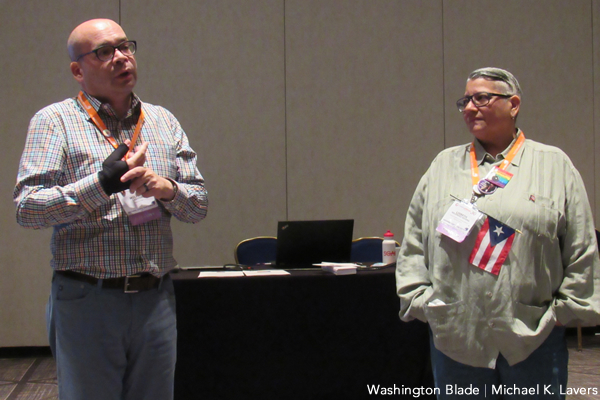 Editor’s note: Washington Blade International News Editor Michael K. Lavers will be on assignment in Puerto Rico through Feb. 3. He will be reporting on the aftermath of Hurricane Maria and its continued impact on LGBT Puerto Ricans and people with HIV/AIDS. “The LGBT work being done in Puerto Rico is being forgotten,” said Wilfred Labiosa, co-founder of Waves Ahead, a group that provides assistance to LGBT Puerto Ricans and other marginalized groups. Labiosa spoke on a panel that focused on Maria’s impact on Puerto Rico and the U.S. Virgin Islands. Lisbeth Meléndez Rivera, director of the Human Rights Campaign Foundation’s Latinx and Catholic Initiatives, co-organized the panel on which she also spoke. Meléndez, who grew up in the Puerto Rican city of Caguas, highlighted the island’s colonial past and current status as a U.S. commonwealth. She noted poverty, poor infrastructure and corruption among Puerto Rican politicians were widespread before Maria. “Things are not well,” said Meléndez. Maria made landfall on Puerto Rico’s southeast coast on Sept. 20 with 155 mph winds. The Puerto Rican government says Maria killed 64 people, but the death toll is estimated to be more than 1,000. Puerto Rico Gov. Ricardo Rosselló last month ordered a review of the official figure. Large swaths of Puerto Rico remain without electricity more than four months after Maria made landfall. Large piles of debris and homes with blue tarps on their roofs are commonplace throughout San Juan, the island’s capital and largest city, and surrounding areas. “Maria took the island and split it in half,” said Meléndez. Hurricane Irma brushed Puerto Rico on Sept. 7. Meléndez was with her parents at their Caguas home during Irma. She said 60 percent of Puerto Rico lost electricity during that hurricane, even though it did not make landfall on the island. “[That] shows you how bad our infrastructure was,” said Meléndez. She returned to the U.S. mainland the day before Maria made landfall. “It was the scariest takeoff I have ever had,” said Meléndez. Labiosa and his partner were in their 15th floor condo in San Juan during Maria. He said every condo in his building flooded because the hurricane’s winds blew water through the storm shutters. “They didn’t know how they could survive,” said Labiosa. Labiosa co-founded Waves Ahead a few weeks before the hurricanes as a way to help his clients open their own businesses in San Juan and the surrounding area. He said some of the same people with whom he was working began to ask for water and food for their neighbors after Maria. Labiosa said he could not reach a transgender client in Humacao, a city that is close to where Maria made landfall, for more than a week because of blocked roads. He noted there was a lack of food, gasoline and medical services for weeks after Maria because the hurricane destroyed Puerto Rico’s electrical infrastructure. The distribution of relief supplies from San Juan’s port was also delayed. Labiosa said Waves Ahead in spite of these challenges “decided to nourish people, nourish the body” by providing the LGBT Puerto Ricans and others with food, water, access to counseling and mental health services. He also noted Waves Ahead is working to provide assistance to LGBT elders, including a 95-year-old woman who lives on the island of Vieques. “They are being forgotten,” said Labiosa. More than 300,000 Puerto Ricans have left the island since Maria. Labiosa said Waves Ahead is working with three families who are currently living in a motel room in Orlando, Fla., “who are dying to come back” to Puerto Rico. Meléndez became emotional when she said her parents, who are in their 70s, are about to lose their home. She nevertheless said they do not want to leave Puerto Rico. 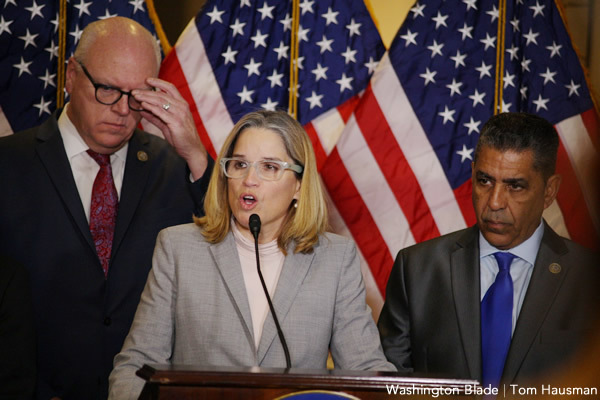 San Juan Mayor Carmen Yulín Cruz remains one of the most vocal critics of President Trump and the federal government’s response to Maria. Former New York City Council Speaker Melissa Mark-Viverito, who was born in San Juan, and U.S. Rep. Luis Gutiérrez (D-Ill.), who is of Puerto Rican descent, have also been sharply critical. Puerto Ricans are U.S. citizens, but are unable to vote in presidential elections. Puerto Rico, like D.C., has one delegate in the U.S. House of Representatives who is unable to vote on the chamber’s floor. Meléndez noted Puerto Ricans who are currently living in the U.S. mainland can vote this year’s mid-term elections. She and others have pointed out they can potentially influence the outcome of congressional races in Florida and other states.